Simply one of the best Tottenham nights! After nearly 24 hours, what can I tell you about this brilliant game; fantastic night and heroic performance and one of the most magnificent nights in the history of our beloved club Tottenham Hotspur? Well, let�s start by remembering that 6 � years ago when we last played here, we lost 4-0. Ronaldo was one of Real�s scorers that night and his fellow 2017 Ballon D�Or nominee Harry Kane was playing on loan at Leyton Orient. Specifically, whilst we were in The Bernebeu on April 5th 2011, Harry was an 85th minute substitute for his loan club, who were then in League One. Now, Harry is described as �The Strong One� by Real Madrid, who certainly highlighted the Spurs striker in the build-up to this game. This time, Spurs were the equals of The European Champions. All their players were heroes, perhaps especially the defenders, who numbered three centre-backs plus the two wing-backs whenever �Los Blancos� were on the attack. That happened a lot, but Spurs also had plenty of attacks and chances, and might have won this game, just as the home side might have scored. Hugo Lloris is currently leading the Spurs man of the match vote, thanks to some more truly great saves, but there was a 21 year old hero in the midfield for Spurs, and that was Harry Winks, who made his England debut just this month, and who has won a lot of plaudits following a fine performance on one of the world�s biggest football stages. Harry could be one of those Spurs players gracing the World Cup in Russia next summer. There was so, so much to admire about this Spurs performance, not least to nominate the strategic brilliance of Mauricio Pochettino, who selected a fine team, despite notable injuries and suspension, and who engineered a brilliant strategy with his formation, which included a surprise start for the experienced Fernando Llorente beside Kane. Real had Ronaldo and Benzema. Why shouldn�t we field two attackers too? Real manager Zinedine Zidane said that Spurs deserved their draw. Because they have scored more away goals, Spurs are ahead of Real in their Group, but this will not be reflected in the table until the conclusion of the 6 Group matches, should the two teams still be level on points. Real are of course a fine team. Former Spur Luka Modric was cheered by the 4,000 strong army of Spurs fans, determined to enjoy themselves and urge their team onto success, when his name was announced. Ronaldo�s name was booed and whilst he is a drama queen when things don�t go his way (and they didn�t several times tonight), he is still a fantastic player. Real so often seemed to have four men forward ready to pounce upon any opportunity, but Spurs had strength, skill and determination at the back in the shape of Sanchez, Dier, Alderweireld and Vertonghen, whilst Aurier would combine strong and skilful defending with plenty of bursts up the line, plenty of threats on the goal area, and even an assist for the Spurs goal. How we cheered and hugged when Spurs took a 28th minute lead. We thought it had been scored by �one of our own�, but it turned out to be an own goal. Aurier was deemed to have fouled Kroos in the box to enable Ronaldo to get a 43rd minute penalty equaliser, but Spurs not only held on, but could (perhaps even should) have won with two fine second half chances for Kane and Eriksen. 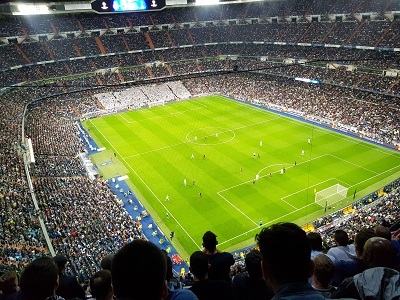 The away section in the 80,000 capacity stadium is located truly �up in the gods�, perhaps even higher than when at Newcastle, with a rake so sharp, it feels like you are on a cliff-edge. That 4,000 strong crowd made itself heard throughout the game, and it was the most electric atmosphere I have been in for a considerable time. There was a moment of reflection and solemn music before the game in memory of those who have recently lost their lives in wildfires in both Spain and Portugal. Real kicked off playing towards the North Stand in which the away fans were located. I was near �Vomitory 529-N�. Spurs had an early half-chance, presented to Llorente after an Eriksen throw from the left. Llorente was one on one with goalkeeper Navas, who won the battle, and a goal kick. Real responded within two minutes when Marcelo crossed deep from the left, Hakimi returned the ball into the box and Ronaldo�s shot looked as if it had been saved by Lloris, but actually rebounded off the post. Benzema hooked the presented opportunity wide. Ronaldo looked to the skies and mouthed a few theatrical remarks, perhaps about his team-mate, or perhaps about the fact that a goal had eluded him. After 14 minutes, Harry Winks sent one of his usual arrow-like ground passes to Aurier, whose cross went straight to the keeper. Ronaldo fired wide at the other end after good play by Modric and Benzema on the right side of the box inside and out. Spurs were giving as good as they got though, and when Harry Kane met Eriksen�s corner and headed first into the ground and saw the ball bounce towards the top of the net, Navas tipped over for another corner. Soon after this Harry showed great skill on the right, tricking two defenders before crossing low for Llorente, whose shot was smothered and cleared. Spurs appealed for a penalty though as Casemiro seemed to catch Llorente unfairly as the ball ran away, but was still in play. Polish referee Szymon Marciniak was not interested. The Polish officials did not seem fully co-ordinated all night, especially when one would signal a corner, and the other would indicate a goal kick. With skilful quick clearing passes on the right, Aurier and Sissoko made a great break for Spurs, and Eriksen managed to retrieve Sissoko�s long ball to the touchline on the left. Eriksen passed inside to Winks, who hit a shot wide across the keeper�s left post. The Spurs goal came after another cross by Aurier, which Harry tried to flick in at the near post, but the ball did still beat Navas off the feet of Varane. It was emotional and loud up in the North-East of The Bernebeu! There were occasions when, despite their overall heroics, a Spurs player would perhaps over-run or lose possession in midfield, and the home side were quick to take advantage. One such occasion was when Eriksen led an attack, but Real responded with Isco�s shot being saved by Hugo. Drama queen Ronaldo was booked for shoving Jan Vertonghen to the ground in the box, but the home fans thought the Spurs man had made a bit of a meal of the situation. Marcelo received a clever lofted ball on the left and hit a shot that took a touch hitting the side netting to win a corner. Shortly after this came the award of Real�s penalty as Serge Aurier stuck a foot out and was deemed to have brought down Kroos. It looked like a dive �up in the gods�, but Aurier had perhaps unnecessarily tried to stop the Real midfielder. He also got booked before the penalty was taken, but it was not clear if this was for the foul or for his comments afterwards. Ronaldo sent Lloris the wrong way and scored to the left of the keeper. After 53 minutes, it looked from our position (and it was a long way away) as if Benzema had missed a sitter somehow, but of course what had happened was that Lloris somehow made a terrific save at close range after Casemiro had presented Benzema with the chance. At the other end Spurs won a corner after good possession play on the left. It was taken by Eriksen, but headed wide by Davinson Sanchez. Hugo made another great save, and this one was from Ronaldo, who looked to me as if he was in an offside position on the right of the area. This came after Harry Winks had lost possession in the middle. Lloris spectacularly tipped Ronaldo�s shot over the bar. He made another save from the Real Madrid number 7 � this time from a shot on the left of goal. Next came two chances in quick succession for Spurs. They were both occasions when I thought we must score. Firstly Harry Kane received the ball on the left after good play by Eriksen, and especially Llorente (lay-off). Harry looked as if he had picked his spot in the corner to the left of the keeper, but Navas made a terrific and essential save tipping the ball outside his post. Then came a chance for Eriksen. Lloris�s clearance was fielded by Llorente, and put into Eriksen�s path towards the right side of the Real Madrid area. Eriksen might have taken a shade too long over the shot, which was also well saved. Following that corner, Aurier crossed for Sanchez, but his effort went wide. In truth, Spurs comfortably saw out the rest of the game. Danny Rose made his first appearance since January, replacing Llorente, and taking up position on the left of midfield. Danny (sporting much more hair) said he was much gratified by the reception of the Spurs fans, as he anticipated some negativity following his remarks before the end of the summer transfer window. Those fans rapturously applauded their team at the end of the game, and loudly sang �He�s magic you know, Mauricio Pochettino� as the manager embraced every one of his players as they left the pitch, before facing the fans and applauding them. This was the sort of bond (between manager/players/fans) I witnessed 20 months ago when we lost in Dortmund, and one I have craved ever since. Long may this bond continue. I can�t wait for our next game (Liverpool on Sunday), but everyone is already licking their lips at the prospect of Real�s visit to Wembley in two weeks� time. P.S - Following Dortmund's 1-1 draw against APOEL in Nicosia, Spurs are put in a strong position in the group, already 6 points ahead of both teams.